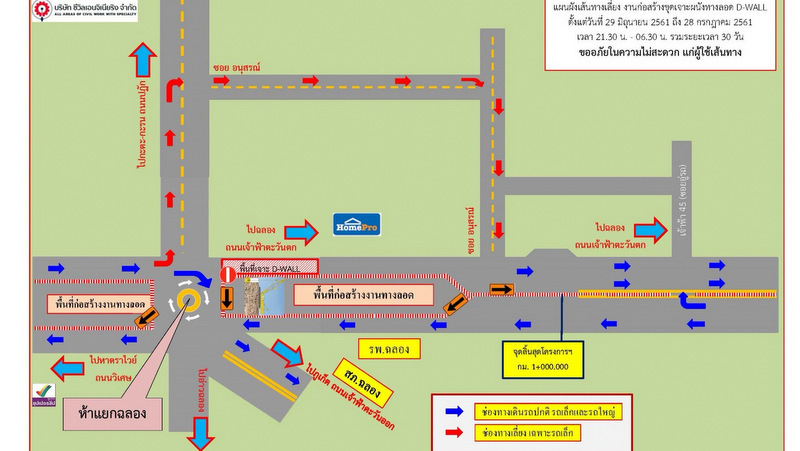 PHUKET: Officials have announced that the busy section of Chao Fa West Rd immediately north of the Chalong Circle will be closed overnight from 9:30pm to 6:30am from June 29 to July 28 so that workers can safely continue the excavation of the Chalong Underpass. The news was announced at a meeting yesterday (June 18), led by Phuket Vice Governor Snith Sriwihok and attended by Phuket Highways Office Director Somwang Lohanut, Phuket Provincial Police Deputy Commander Col Witoon Kongsudjai and Rawai Mayor Aroon Solos, officers from relevant government organisations and representative of contractor company. V/Gov Snith urged relevant organisations to conduct appropriate public relations campaigns to inform people of the road closure to minimise the impact on traffic. A map showing the redirections required was also released yesterday, showing that motorists travelling in small vehicles from either Karon or Rawai are urged to use Soi Anusorn from Patak Rd to travel around the road closure and continue their journey along Chao Fa West Rd further north of the road closure. Larger vehicles are to deviate at Chalong Circle and drive along Chao Fa East Rd to continue their journey northbound. All vehicles coming from Naiharn/Rawai should be directed straight to Chaofa East Road, as traffic coming from Karon/Kata already 'over use' Soi Anusorn. If coming from Rawai, directed to Soi Anusorn, they have to cross Patak Road to the right. What a mess it will become.Spread the traffic flows with more sense. This is going to be a very big messing month. Where is all big buses and trucks with more than 6 wheels go ??? If this going to happen, PLEASE be sure that NOBODY is using the road as parking.